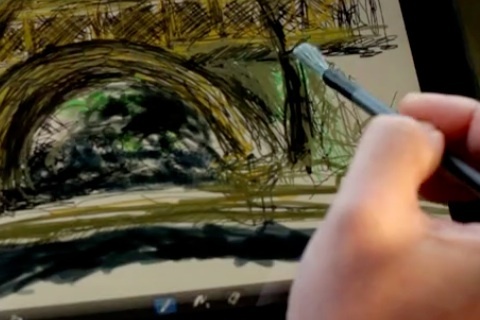 Nomad Brush is a paint brush that uses capacitive bristles allowing you to use it instead of your fingers for painting on the iPad’s touch screen display. The Nomad brush gives you the same exact effect as does using your fingers, nothing more and nothing less. You get touch sensitive drawing, but not pressure sensitivity, as you might expect from a digital brush. Let’s hope in the next version of the iPad iOS, Apple implements support for pressure sensitive drawing. You can purchase a Nomad brush online from the nomadbrush.com website for $24 and have it delivered to you. As of right now they are on back order so you might to wait a bit longer. I tested the brush using the popular SketchBook Pro iPad app. The brush tips are not too hard and a bit closer to the soft side, which helps prevent scratches. The developer states that they are made of a blend of natural conductive fibers. They don’t feel much different from a regular paint brush. The brush stick is made of wood material and is very light. There is a rubber material near the top that covers the connection between the brush and the bristles. Using the brush doesn’t take too much pressure, although you do have to apply a slight amount to draw. 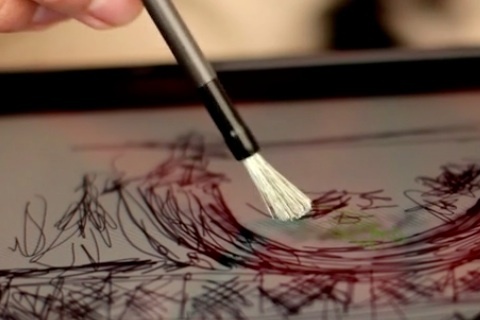 The brush can invoke both swipe and tap gestures on the iPad. You can get some very smooth curves once you get the hang of it. The brush comes shipped in a small cardboard box with a small card explaining care instructions. You have to take care not to get the bristles bent and store the brush away when not in use to avoid bending the tips. I wish the storage box was wooden or at least more sturdy. Another helpful feature would have been to provide customers with a small hard cap for the brush to protect the tips. You can store the brush away in the provided cardboard box, but the box is a bit too large to carry around. Overall, the Nomad Brush does a great job of replicating draw gestures and in my opinion delivers an enjoyable drawing experience. Using the brush to draw feels natural, much better than using a stylus or your fingers. Compared to repeatedly rubbing your fingertips on the glass, using the brush is less tiring on the user. Worth the price if you are doing a lot of drawing with art apps on your iPad. AppSafari review of Nomad Brush was written by Joe Seifi on February 23rd, 2011 and categorized under Accessories. Page viewed 4737 times, 2 so far today. Need help on using these apps? Please read the Help Page. I thought it was expensive but seems nice. I’ll give it a try.